The heat loss in a floor is greater at the exposed perimeter edge of the floor. To calculate the U-Value, the exposed perimeter edge to area ratio needs to be worked out e.g. – a 100m² area, semi-detached house with 3 external walls of 10m each has a perimeter edge to area ratio of 0.3 (i.e. 30m ÷ 100m² = 0.3) which, using Foil-Tec Single, gives a U-Value of 0.3 W/m²K. 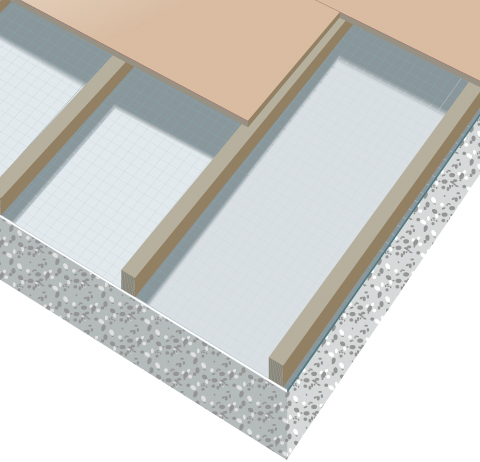 Timber battens/joists (min 50mm x 50mm) are then laid on top of the Foil-Tec Single, spaced at cebtres to suit the particular flooring. The decking is then fixed with screws (at 200mm centres) into battens/joists providing 25mm penetration into the 50mm wide battens/joists.